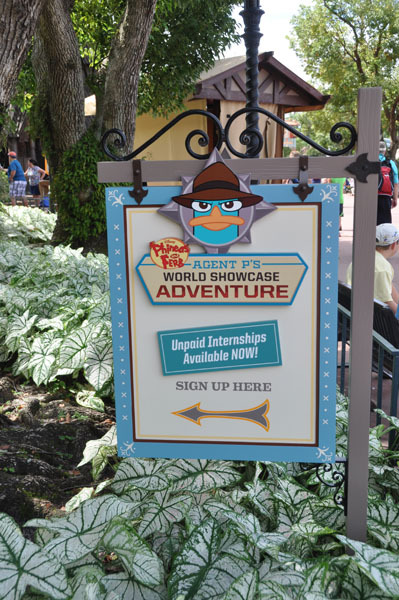 Agent P’s World Showcase Adventure is up and running at Epcot’s World Showcase. For previous visitors of WDW, Agent P is basically a repurposed Kim Possible. For those of you new to this interactive way to visit the countries, I would highly recommend doing it! This is a free activity at the park and is a great way for kids to enjoy the World Showcase. I would do this in conjunction with the Kidcot stations where the kids color a Duffy Bear and get stamps at each country. Both of these are free of charge and the Kidcot is a free souvenir. You can sign up at an Agent P kiosk at the International Gateway or the Odyssey Bridge between Future World and World Showcase. Innoventions had a place to get your mission, but that is not open yet.